Only certain clients have access to this functionality. Please contact us for more information.. 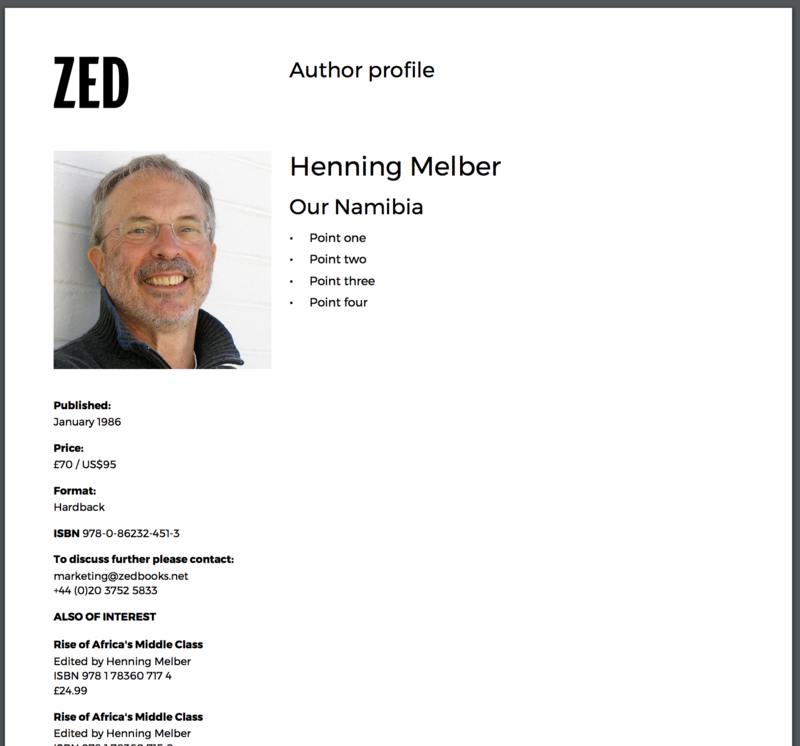 Author profiles are generated in a similar way to advance information sheets. Go to the contact page, and go to Marketing > Image. Click the Add button to upload an image. Set the file type to public . The author profile PDF adapts to whatever image dimensions have been uploaded, so use any image size you like. Go to Work > Metadata and scroll to Contributors. Click on the author’s name. Add your author points to the last field on the page, using the formatting buttons to add bullet points if required. Click Save. Up to three other products by the same author appear on the left of the PDF. You don’t need to do anything other than make sure the author is down as the author for each of their products. The other products are ordered by publication date descending. Go to Work > Metadata, scroll to Contributors, and click on one of the file icons in the contributor’s table. The PDF loads in the browser.